Welcome to The Abso!ute Sound online! We explore music and the reproduction of music in the home. We believe that the sound of music, unamplified, occurring in a real space is a philosophic absolute against which we may judge the performance of devices designed to reproduce music. Our goal is to provide the resources consumers need to judge how a component's sound either honors or departs from the music's truth, and to make sound purchasing decisions that maximize their experience of reproduced sound. Below is our Issue 149, August / September 2004 table of contents and editorial. Hot new products on the horizon. Paul Seydor spins Pro-Ject's RM 9 turntable and Sumiko's Blackbird cartridge, and sets it all atop Townshend’s Seismic Sink Isolation Platform. Share a near-religious experience with Jon Valin and Wayne Garcia. Take a guided tour of the Big Apple’s Spring Show with Jonathan Valin and Robert Harley. The solid-state gear from Edge Electronics is unlike anything he’s heard before, so says our editor Wayne Garcia. Harry Pearson, Doug Sax, and Jonathan Valin discussing and debating the sonic merits of various audio-storage formats—from analog tape to today’s high-resolution digital media. Robert Harley moderates. Meet, if you dare, R. Harley, W. Garcia, and J. Valin. Alan Taffel listens to this sweet and affordable number from Rotel. A lot of good speakers are priced below $2000; Neil Gader reports on four of them. Chris Martens checks out a set of intriguing electronics from Great Britain. Spend two grand for a CD-only player in this day and age? Neil Gader tells you why you should. Nothing wrong with a big ol’ British box speaker, so says Robert E. Greene. Wayne Garcia on the latest from primo designer Andy Payor. Chris Martens takes another listen to a controversial power conditioner. In-depth report on Avalon's latest jewel-studded flagship, by Robert Harley. 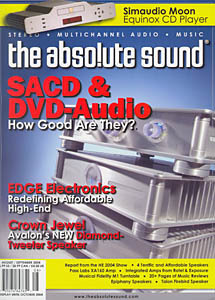 Anthony H. Cordesman calls the Pass XA160 "an amplifier with soul." A Japanese contender for the best amp available — Fred Kaplan reports. Anthony H. Cordesman extols the musicality of Talon's new speakers.